I am 97 and have been working out with Derick for over a year now. When we started I was so depressed that living seemed unbearable. Within a short period of time I began to feel stronger and started doing things that I couldn’t do before. I couldn’t take a shower for fear of falling down. This was the first thing I accomplished that gave me hope. I had stopped walking up the hill where I live and stopped sitting on certain chairs because they were too hard to get up from. Now I walk up the hill and sit wherever I want. I even do 60 crunches at the end of the workout and can get up from the ground by myself. Derick makes me do exercises during the workout that sometimes I just don’t want to do. I try to talk him out of it, but he has a way of making me do it anyway. I have tried with other people but it just didn’t work out. It’s only Derick’s spirit and enthusiasm that the turns something as boring as exercise into something I look forward to. 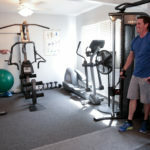 If you’re serious about looking your best – and you’re serious about doing something about your weight – and you’re serious about extending your life expectancy then Derick and Vicki are the premier personal trainers in the foothills. My wife Marilyn and I are very pleased with our progress. We feel better after working out, we like the personal attention and the program’s designed just for us. You owe it to yourself and your family to contact Derick or Vicki for a free and comprehensive checkup … particularly if you are a senior aged person. Working with a professional personal fitness trainer has given me a whole lot more energy and sense of well being. My wife loves what it has done for my appearance. Working with Derick is like hanging out with a friend. Vicki is a joy. She has such a positive, upbeat personality that I really look forward to working out. She’s been my trainer for a number of years and I feel better, look better and have so much more energy than I did before. 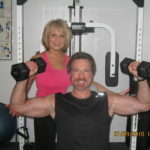 Vicki is my inspiration, as well as my mentor – she’s got me hooked on staying in shape. 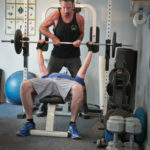 Derick Rotunno provides private personal training that gets results. The gym space is small but has all the essentials for a great workout. Using the cardio machines between sets kept my heart rate up for the entire workout, making it more effective than weight training alone. His body fat testing is high tech with a special device as well as calipers. Training also included tracking food choices and making recommendations. My progress was charted by both weight and measurements. Derick’s excellent knowledge of his field helped keep me from getting injured as I built strength, especially in my upper body. I had had neck surgery previously and this did more to get me in shape and back to an active lifestyle than working with a physical therapist. Highly recommended. We have several 5 star reviews on yelp! but you have to dig deeper to see them. There has been a lot of controversy about yelp! and their policy of filtering reviews. They say they have special software that determines if a review should be “recommended.” Perhaps it is just coincidence that businesses that do not spend large amounts advertising on yelp! have more filtered reviews. If you wish to visit the site and see what our clients have been trying to say click here.